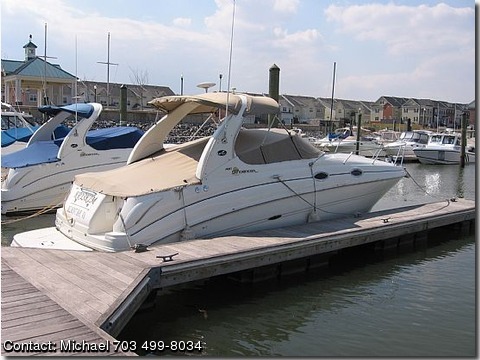 This Sea Ray is 31ft overall in size and sleeps six. The convenient galley has a sink, stove, refrigerator, microwave, cherrywood cabinets and Corian counter/table tops. SHe has a fully enclosed head with Vacuflush toilet, sink shower and a full length mirror on the door. She has rare twin 5.0L MPI bravo III stern drives. She also has a generator, AC and full canvas camper, options found on yachts. She looks and runs like new. Call for more information, if no answer leave a message and I will return your call asap.